The very first food blog I subscribed to is called The Bitten Word. It is put together by Clay and Zach who live in Washington D.C. and have subscriptions to loads of food magazines. The piles of magazines were largely untested and unread – leading to a resolution some six years ago: to cook (and blog) at least one recipe from each magazine. Since then, the pair have become quite popular in the food blogosphere. Their candid and humble descriptions of grand successes and epic fails are entertaining and encouraging to the home chef. The remind that the culinary adventure is more about the trip than the destination. Another annual tradition for the Bitten Word is the cover-to-cover challenge. The concept is to cook and review all the recipes from a specific issue of a food magazine. They completed the challenge themselves the first time around. Afterwards, they cleverly recruited their followers to help with the undertaking by assigning each recipe to 5 participants. Each submit a photo of their version along with a short review. This was my contribution last summer when I was tasked to make Striped Bass with Lime Broth. It is very interesting to read the varying experiences with the recipes, thoughts and suggestions. About 10 days ago, the Bitten Word launched a holiday challenge – cover-to-cover Holiday Cookies! Without hesitation I signed up. 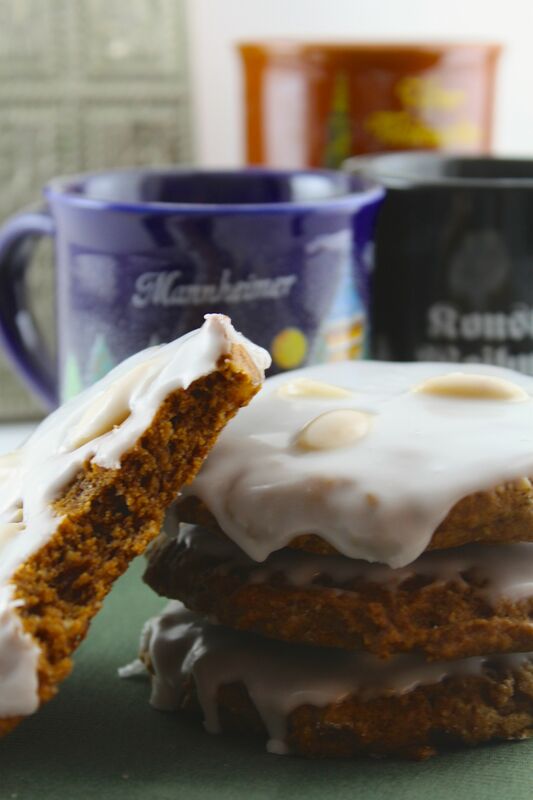 This time around I was tasked with Lebkuchen – particularly appropriate for me as I spent a year abroad in Germany and search out Lebkuchen each Christmas! 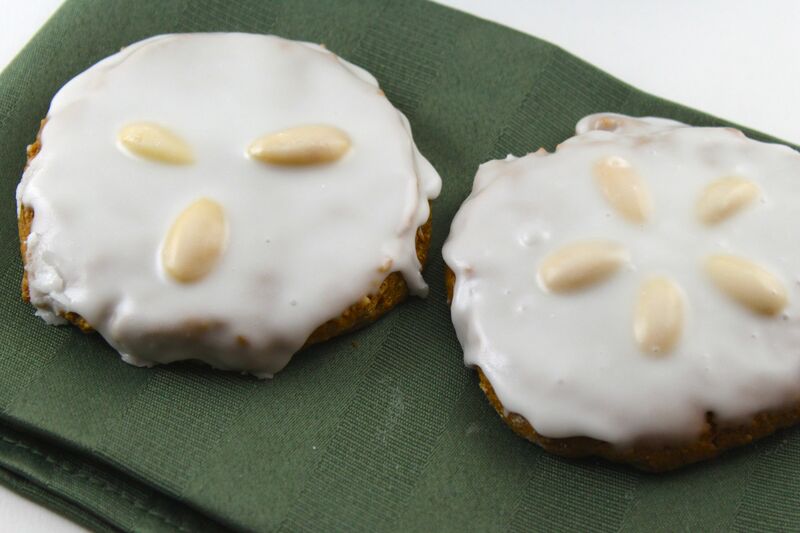 The recipe was pulled from Food and Wine and is a simple, spiced Lebkuchen adorned with blanched almonds and topped with plain icing. I normally indulge in a chocolate-covered and apricot-jam-filled version of the German treat. 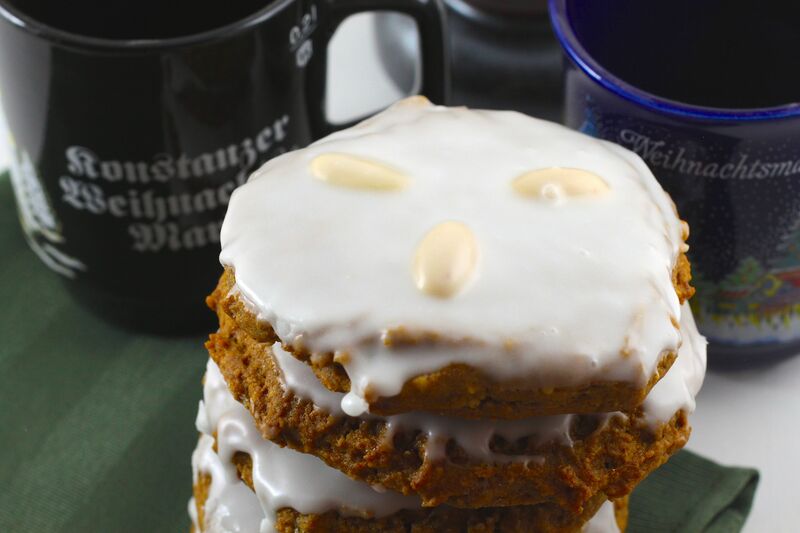 In the end, the cookie has all the hallmarks of good Lebkuchen – a gently spiced cookie dotted with citrus peel. I replaced the orange and lemon peel with mixed citrus peel (consisting of orange, lemon and citron). Also, the instructions infer each cookie should be portioned with a 1/4 cup measure. The cookies are large and are not true to the recipe photo. The second batch to hit the oven were halved and are more typical cookie size. I am not convinced I will make these again – but can easily be swayed. Let’s see how my Band colleagues enjoy them at our Christmas party tomorrow night. In a small bowl, stir the cream and vinegar together and let stand until thickened, about 30 minutes. Preheat the oven to 325°. In a medium bowl, whisk the all-purpose flour with the almond flour, candied orange and lemon peels, cinnamon, cloves, allspice, baking soda, nutmeg and salt. In the bowl of a stand mixer fitted with the paddle, beat the brown sugar with the shortening and molasses at medium speed until light and fluffy, about 3 minutes. Add the thickened cream and beat until smooth. Add the dry ingredients and beat at low speed just until combined. Line 2 large rimmed baking sheets with parchment paper. Working in 2 batches, using a 2-ounce ice cream scoop or 1/4-cup measure, scoop the dough into mounds on the prepared sheets, spacing them 3 inches apart. Place 3 whole almonds in a star pattern on top of each cookie and, with the palm of your hand, gently flatten each mound slightly. Bake the cookies for about 15 minutes, until lightly browned; rotate the baking sheets from top to bottom and front to back halfway through baking. Let the cookies cool on the baking sheets for 10 minutes, then transfer to a rack and let cool completely. In a small, wide bowl, whisk the confectioners’ sugar with the milk until smooth. Dip the top of each cookie in the glaze, letting the excess drip back into the bowl. Transfer the cookies to a rack and let stand until the glaze hardens, about 10 minutes.